I was hoping to post this before 2016 but alas that didn't happen. 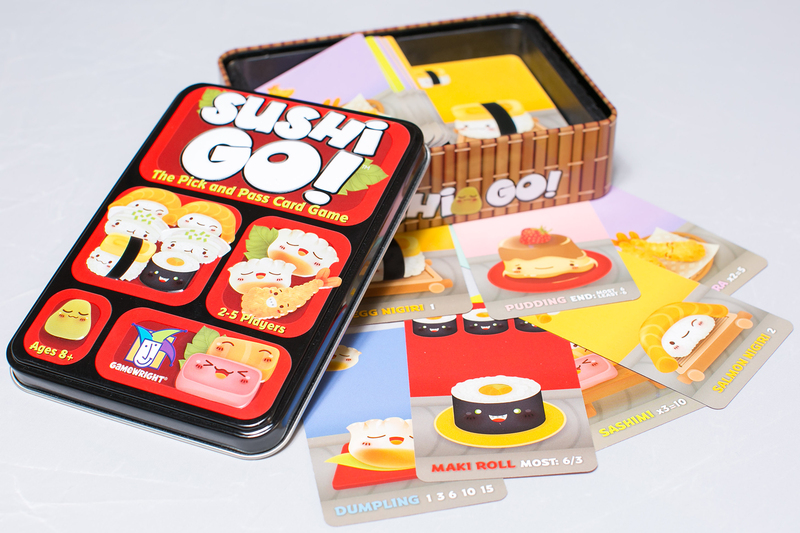 It was write a blog post or ring in the new year with games. How could I not choose games? Well, better late than never! I gradated from Wake Forest University with my Masters in Mathematics! Very exciting! You can just call me, Master Heather now. Haha. Okay. I'm kidding, but that was a pretty big deal. Having finished up my masters at Wake, I had to move onto bigger and better things. So why not a PhD in another country? Yup, 2014 was the year I started working on my PhD in Mathematics at a university in Canada. I took my car with me so my mom and I made a 3 and a half day road trip across the continental United States. Along the way, we stopped at several national landmarks. Visited Metropolis, KY and met Superman! because of my intense fear of heights. That thing is bigger than you think it is! Took the scenic route from St. Louis to stay in Mark Twain's hometown. Fittingly, this took us by the Mississippi River. It was the first time I'd ever seen it! Stopped in Marceline, MO to see Walt Disney's hometown. Visited the squirrel jail in Iowa. And no, it's not a jail for squirrels. Corn Palace in Mitchell, SD! I think they were working on the next year's palace. Badlands in South Dakota. This was a detour, but the pictures do not do it justice! They were beautiful! The fields in SD were so golden. It was amazing to see. Didn't stay long in Glacier National Park, Montana. I was eager to cross the border. We were going to stop at Mt. Rushmore in South Dakota and Devil's Tower in Wyoming, but South Dakota just took too dang long to cross. Also, I wish I'd gotten more pictures of Wyoming but we crossed most of it during the night. It was soooo beautiful though. At least at dusk when I saw it. I wouldn't mind going back to Wyoming one day. Man, that section took forever! There were just so many pictures to share! And more to follow! 2014 marked the first time I visited the Rocky Mountains. I got to go to Lake Louise as well as Banff! Both were beautiful but I think Lake Louise was my favorite! More from Banff. The water was crazy blue! and powdered sugar. Soooooo good! Ate lunch on Lake Louise. Not sure who the random couple is. This is the only picture I could get with the fewest people. Apparently, everyone wanted me to take a picture of them. where I ate lunch. That's a hotel. Ugh, more people. But it was still pretty! The water was SOOOO blue. I really wish the pictures captured it better. I definitely recommend visiting if you get the chance! Royal Tyrell Museum aka DINOSAUR MUSEUM!!! Drumheller is home to the Royal Tyrell Museum aka one of the biggest dinosaur museums! IT WAS AWESOME! They had ALL the dinosaurs. Okay not all but they had a lot! It was sooooo cool! You should definitely, definitely, DEFINITELY go if you ever get the opportunity! This one asked me to take a picture with it. It has a great smile! They were all about the gruesome displays. I think you got everything on that one, buddy. Tallest dinosaur in the world! Yup, those are people in its mouth. I went up. It was a lot higher than I realized! Since I'm in Canada, I should probably go to a hockey game. And I did! It was a lot of fun! I really enjoyed it! Definitely a sport I wouldn't mind watching! This was a school match. I was rooting for the red and white team. A little hard to see but we actually won! Yay! If you haven't guessed by now, I'm attending the University of Calgary for my PhD. In 1988, Calgary hosted the Winter Olympics (check out Cool Runnings if you haven't already). The Olympic Oval is actually located on the University campus and I got to skate on it! It's actually free to students if you have skates! It was a lot of fun! And despite there not being any railings, I didn't fall once! I CAN'T BELIEVE I ALMOST FORGOT THAT HOW I MET YOUR MOTHER ENDED IN 2014!!! There was a lot of crying involved with this finale (I think one of my roommates was a little concerned to be honest), but I absolutely loved it! It was a really great way to end the series. Honestly, the only way to end the series and I don't care who thinks otherwise. It made the whole show make sense. I saw the other ended they'd originally planned and it was stupid. The one they stuck with in the show was SOOOOO much better! OH! And another big thing that happened in 2014 was that I passed my first prelim! Prelims are big tests based on specific areas related to your research that you have to take during your Math PhD. Very exciting! Hopefully, I'll be able to put up a summary of 2015 before the end of the day! In typical fashion, I've come back to my blog as the year is coming to an end. I noticed that I actually didn't do that for the last two years! It's been almost three years since I last posted and a lot has happened. Let's see... 2013 was a relative eventful year. I got to meet Neil Gaiman, one of my favorite authors! I'm sure you haven't guessed that yet. I took my sister to one of his book signings for The Ocean at the End of the Lane. It was a really awesome day! He read a chapter of the book and answered some questions from the audience. If you've never heard him speak, then you should! His voice is basically liquid chocolate. Here's a link to him reading The Graveyard Book: http://www.mousecircus.com/videotour.aspx. It's similar to The Jungle Book but it takes place in a graveyard. My sister and I listened to The Graveyard Book together. 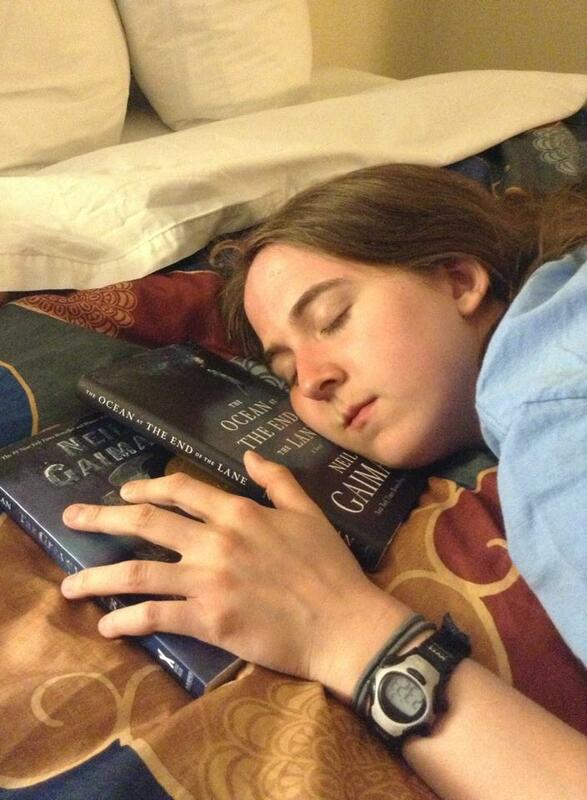 It was her first Neil Gaiman book. So that book kind of has a special place in my heart. I did try to get a picture with him but my sister is not the best photographer. It was still a memorable day. I can't believe it was almost 3 years ago now. after a very long day of travel and standing in line. 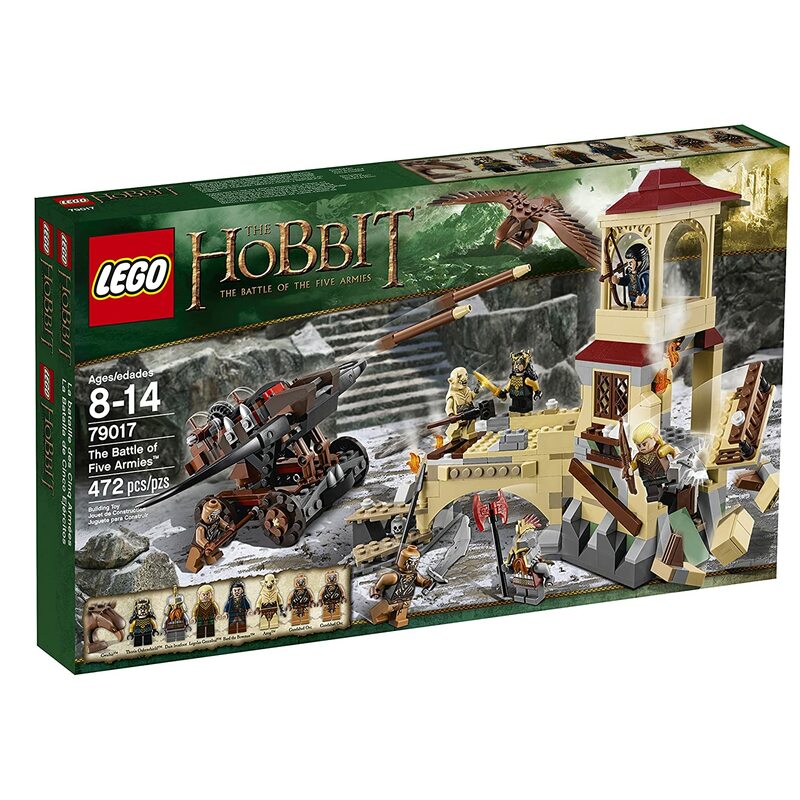 I got the LEGO Lord of the Rings and Hobbit: An Unexpected Gathering set! Yes, LEGOs make the list of big life moments. Haha. That was a really fun set to put together. 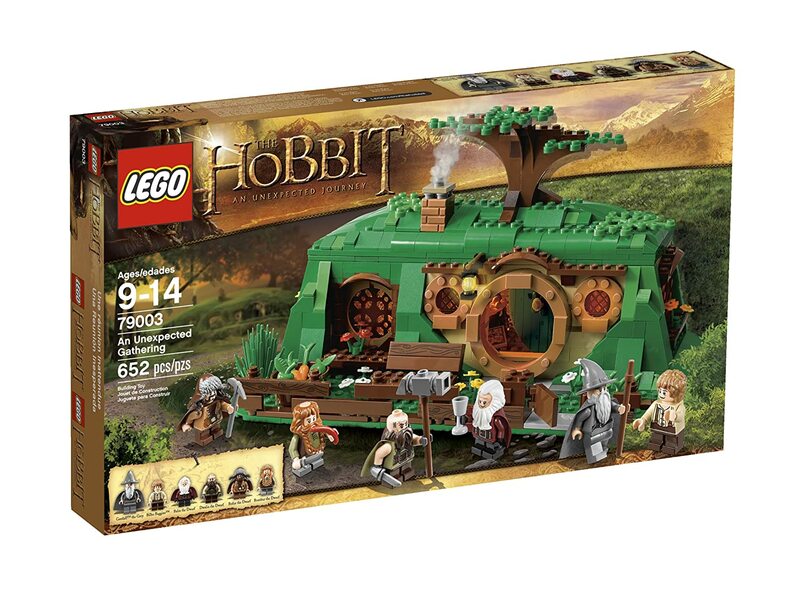 Also, it contains a LEGO figure of my favorite dwarf: Bofur! He was the best! I really love the actor who played him too! If you haven't checked out the show Jekyll, then you really should! That guy is a phenomenal actor! Anyway, the set was fun to put together and I did a series of silly pictures of Bofur doing silly things. I'll have to make a blog post of his silly ramblings and post a link here later. They were pretty amusing. I think Frozen was released in 2013... yeah, it was. Man, I loved that movie! I know, I know, almost EVERYONE loved that movie, but having a sister myself, I could really relate to that movie. Besides, ask anyone, I'm basically Ana. Haha. Super cute movie. I probably saw it a billion times. I'll move onto 2014 in the next post. My sis is telling me that 2 and half years of updates should be spread across multiple posts. My entry for the Blogger's Quilt Festival resulted from a friend who spent all of my undergrad telling me to watch Doctor Who. 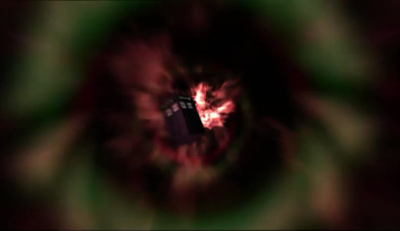 For those of you unfamiliar with the show, it is the longest running sci-fi show and is about an alien who travels through time and space in a Police Public Call Box from the '60s called the TARDIS (Time And Relative Dimension In Space). For reasons unknown, I continually put off watching it. Honestly, I don't know why because my friend and I have similar tastes in television shows so it wasn't like I didn't trust his opinion. I just waited until this past summer to finally sit down and watched the show. What I really mean by that is marathon all six of the current season in less than 12 days with my younger sister. Yeah, we didn't have much to do that summer. Anyway, the fact that we ended up watching every episode available in less than 12 days suggests that I kinda became a fan of the show. Well, there's really no "kinda" about it. I'm a huge fan as you've probably guessed from my posts last summer. Isn't it pretty? :) I used Royal Blue Kona Cotton for the main part of the TARDIS, Navy Kona to distinguish the panels, White Kona for the windows, lamp and letters and Black Kona for the sign and first outside border. Legacy Studios fabric was used for the green border and the orange border. You can see that the TARDIS is traveling through a tunnel with green and orange-ish clouds over black space. I picked the faded orange Legacy Studios fabric to pick up the orange clouds and the green swirls Legacy Studios fabric to pick up the random bursts of green. Finally, the quilting was also inspired by the show. This is best scene from the back of the quilt. 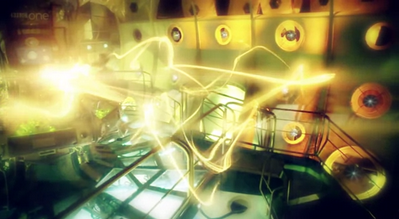 Without giving too much away, the gold light flying around the control room of the TARDIS is in essence the TARDIS herself (it's weird but that's Doctor Who for you). Quilting with the gold thread to make stars and galaxies on the back produced an effect on the front which truly captures what I love about "The Doctor's Wife." I finally finished this last January, and it has been keeping me warm through the second half of season 7. I love it so much! Quilted by: Me! With some help from Aunt with applique and binding. Thanks for visiting my blog and hope you enjoyed my quilt! Hope you come again! Blogger's Quilt Festival! There are lots of pretty quilts! Okay. So I just finished watching a TV series called Jekyll which first aired on BBC in 2007. If you're looking for something interesting to watch, you should definitely try it! It was fantastic! It was created by Steven Moffat who also create one of my other favorite shows Sherlock and is also the current head writer for Doctor Who. Similar to concept of Sherlock, Moffat set the plot of Robert Louis Stevenson's "The Strange Case of Dr. Jekyll and Mr. Hyde" in present day. James Nesbitt plays the "Jekyll" character. Look familiar? 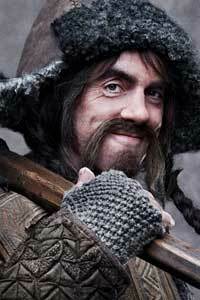 Well, if you've seen The Hobbit: An Unexpected Journey then you might recognize him as Bofur the dwarf. Now you're probably curious as to whether or not good-guy Bofur can pull off iconic duality of Jekyll and Hyde. Let me tell you, James Nesbitt can! He is fantastic. It's amazing how well he shifts between the two characters and makes you terrified of Hyde while extremely sympathetic to Jekyll. He does a spectacular job. I cannot praise his performance in this show enough. I can't wait to see Nesbitt in other roles. He truly is an amazing actor. Overall, Moffat really did a fantastic job with this series. If you are familiar with either his work on Sherlock or Doctor Who, I would say that plot-wise, Jekyll is a lot more like Sherlock and his earlier two-part episodes of Doctor Who (not his stuff as head writer- honestly I don't think he does nearly as good a job as Davis did), i.e. he does a better job of keeping his plot together and pulling off those usual Moffat-esque surprises. It really is a brilliantly done show. Most of the actors do a pretty fantastic job. There is the token American who is kind of pathetic, but whatever. Also, if you really enjoy dark humor, this show is definitely for you. There's a scene in Episode 2 that cracks me up just thinking about it. The only unfortunate thing I can say about this series is that Season 2 is non-existent. It ends on a fairly decent wrap-up but I think Season 2 could have been pretty awesome. According to imdb.com, Moffat has written Season 2 but BBC refuses to make it which I find really sad because it really is an amazing show! Hope you have time to check it out and let me know what you think! P.S. This show is available on Netflix and Amazon Prime!